CATALINA ISLAND — While New Yorkers may ring in the new year in bustling Times Square, Southern California boaters can enjoy a much more laid-back celebration, surrounded by the beauty of Catalina Island. There are two different party options for those who want to welcome 2014 on the island — the traditional gala at the Catalina Casino in Avalon, and the New Year’s Eve Party at the Harbor Reef Restaurant at Two Harbors. The island’s biggest New Year’s Eve celebration, hosted in the grand ballroom of Avalon’s famous Casino, will feature live entertainment from the Xceptional Music Company Rock Orchestra. They will perform music from the 1960s to the present, plus a few songs from the Big Band Era. The New Year’s Eve Gala at the Casino includes a buffet dinner, a gourmet dessert and coffee, plus dancing, one champagne split per person, a bottle of wine in a specially engraved bottle (#15 in a series) and party favors. 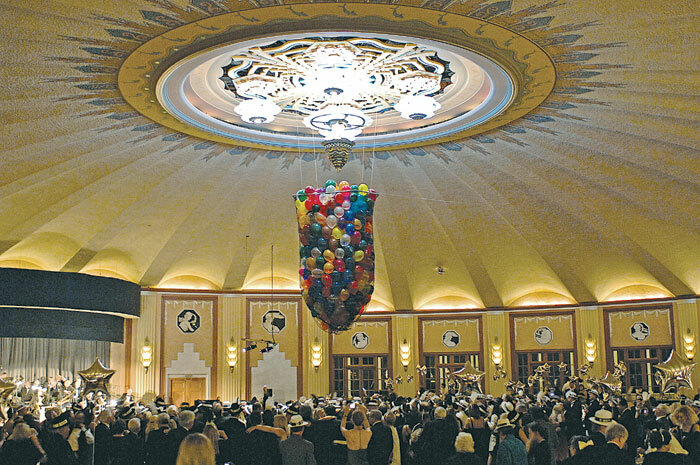 A balloon drop is planned at midnight. Dinner reservations for this year’s gala are $195 per person and will be accepted for 7, 7:30, 8, or 8:30 pm. Guests will be admitted into the ballroom no more than 15 minutes before their reservation time, but they can wait in the Marine Bar on the mezzanine, where seating and beverages are available. Regardless of the time of the reservation, tables are reserved for the entire evening. Parties of three to 10 people will be seated at individual tables, and parties of 11 or more will be seated at two or more tables next to each other. In order to keep the dance floor as large as possible, parties of two will be seated with one or more other parties of two. The event’s traditional dress code will require men to wear a coat and tie; black tie attire is optional. Mail requests for reservations should be addressed to the Catalina Island Chamber of Commerce, P.O. Box 217, Avalon, CA 90704. All reservation requests must be accompanied with full payment, and reservations will be confirmed by letter. Reservations can also be made by phone — at (310) 510-1520. For more information, call the chamber or email info@catalinachamber.com. Boaters heading to Two Harbors can celebrate New Year’s Eve at the Harbor Reef Restaurant, where a special four-course meal will be served. Music will be provided by a live DJ. Along with dancing on the patio, a midnight toast is scheduled. All guests will receive a commemorative Two Harbors New Year’s Eve champagne glass. Shoreboats will be available for boats moored in Two Harbor, allowing celebrants to leave the dinghy driving to the professionals for the night, and enjoy the evening. Reservations for the Two Harbors New Year’s Eve Celebration can be made at (310) 510-4215. Breakfast will be served from 8 a.m.-noon. For more information, call Antonio’s Cabaret at (310) 510-0008.